Riverchase Dermatology presents a fun, informative evening with great giveaways! 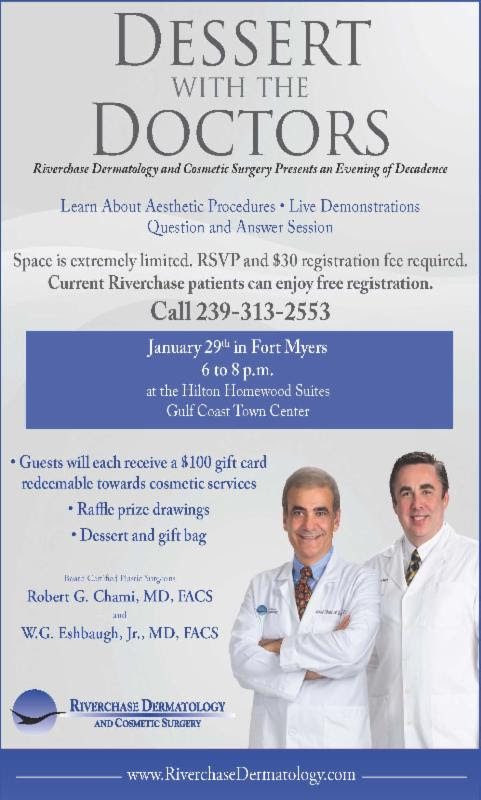 Join Riverchase Dermatology and Cosmetic Surgery for its exclusive “Dessert with the Doctors” event! On January 29 in Fort Myers, Riverchase’s plastic surgeons, cosmetic dermatologists and aesthetic team will present an evening of decadence, education and exciting gifts. All guests will receive $100 cosmetic service gift cards, product goody bags and the opportunity to win raffle prizes. Riverchase’s skilled physicians, including Board Certified Plastic Surgeons Robert G. Chami, MD, FACS and W.G. Eshbaugh, Jr., MD, FACS, will offer insight on the practice’s extensive list of cosmetic services while guests relax, enjoy dessert, observe live demonstrations and participate in a question and answer session. Call 239-313-2553 to reserve your seat today. The event will take place at the Hilton Homewood Suites near Gulf Coast Town Center from 6 to 8 p.m. Space is very limited, and a $30 registration fee is required. Current Riverchase patients can enjoy this event for free on a first come, first serve basis. For more information, visit the Riverchase Dermatology and Spa Blue MD Facebook page, visit www.riverchasedermatology.com or call 239-313-2553. Riverchase Dermatology and Cosmetic Surgery is Southwest Florida’s largest and most comprehensive skin center. Founded in Naples, Florida in 2000 by Andrew T. Jaffe, MD, Riverchase has maintained its initial vision of providing the best comprehensive skin cancer, dermatology and cosmetic surgery services for over a decade. The caring and skilled providers at Riverchase use the latest techniques and equipment to diagnose and treat a wide range of skin disorders and cosmetic concerns. Riverchase has many convenient Southwest Florida locations in North Naples, Downtown Naples, Marco Island, Fort Myers, Downtown Fort Myers, Cape Coral, and North Port. In addition, Riverchase also has two Spa Blue MD locations offering aesthetic spa services in North Naples and Fort Myers. For more information, call 1-800-591-DERM (3376) or visit their website at www.riverchasedermatology.com.